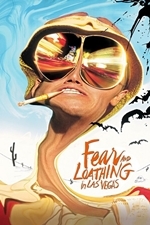 Fear and Loathing in Las Vegas is a 1998 American avant-garde black comedy road film, adapted from Hunter S. Thompson's novel by the same name. It was co-written and directed by Terry Gilliam, starring Johnny Depp as Raoul Duke and Benicio del Toro as Dr. Gonzo. The movie was a box office failure, grossing US$10.6 million at the North American box office, well below its $18.5 million budget. It has since become a cult film due in large part to its release on DVD.